Wine tasting appetizers can make the difference between a good wine tasting and a great one. At a wine tasting the focus may not be on food and wine pairing or even serving much food if it is not a dinner party. 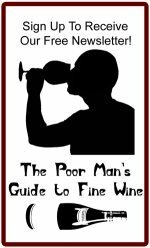 However, drinking wine stimulates appetites and most people are happy to have food available even if the focus is primarily on the wine. Having finger foods on hand can help satisfy that craving and some, like bread or crackers, can also help to cleanse tasters palates between wines. 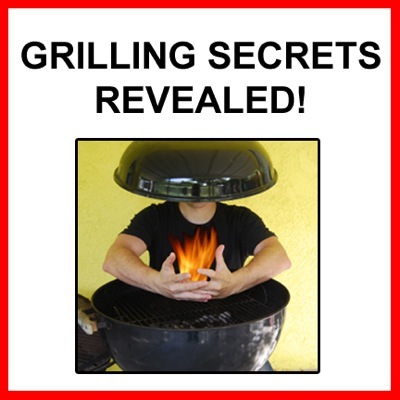 However, if the focus is on the wines, you want to keep the food easy and quick. Here are some tips and ideas for good wine tasting appetizers to serve at your next wine tasting party. Bread and/or Crackers: You really can't have a wine tasting without bread or crackers available for your guests to snack on. Typically people buy one or two French baguettes that are sliced thin into oval pieces beforehand. Alternatively you can serve any type of simple cracker. These can be simply set on the table throughout the evening for guests to help themselves. Besides helping to fill people up, these are good for accompanying cheeses and bread makes a great palate cleanser between wine flights. Avoid breads that are very strongly flavored or very sweet. Cheese: Cheese and wine is a match made in heaven. The two seem made for each other. A nice cheese plate will always be appreciated at any wine tasting or dinner. Again, leave it on the table and let guests help themselves. Be sure to have serving forks and/or knives available. If you serve soft, spreadable cheese like Brie, Camembert and other high milk-fat cheeses be sure to have bread or crackers available to spread it on. Avoid very strong, stinky cheeses which will perfume the room and get in the way of tasters ability to focus on the aromas of the wines! While many stinky cheeses are sublime and make good food and wine pairing, their strong personality can make the subtleties of the wine hard to appreciate. Nuts and Dried Fruit: Very commonly, dried nuts or dried fruit pieces are served as wine tasting appetizers. Nuts can accompany cheeses beautifully and are fairly neutral flavored so that they don't interfere with wine tasting. Any kind are probably fine but we really love nice Marcona almonds and walnuts in particular. Cured Olives: Another ubiquitous wine tasting appetizer seen on the tables of many restaurants and keen entertainers, cured olives make a great snack to enjoy while drinking wine or waiting for dinner. There are many varieties of cured olives ranging from relatively mild to spicy and highly herbed types. In general, stick to the milder olives and avoid the very spicy ones which can clash with many wines. Some excellent options are Lucques, Picholines, Niçoise, Maroccan and Greek Kalamata olives. Don't forget to supply a pit tray or bowl for guests to put their olive pits! Bruschetta: Bruschetta is a simple dish of toasts (usually sliced baquettes) usually topped with ingredients such as chopped tomatoes, shallots, cheese, garlic, olive oil and salt and pepper. There are many variations you can find recipes for but most are great, easy to make finger foods that make a great light snack at wine tastings. For a simply version, rub bread slices with garlic, toast lightly, then cover with chopped tomato, shallots, drizzle olive oil and salt and pepper. Experiment from there as you like, adding various cheeses, herbs, cured meats, other veggies or mushrooms. 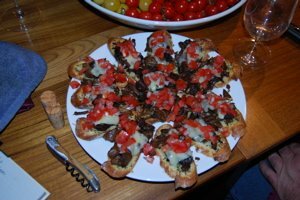 The wild-mushroom bruschetta pictured above is one of our favorites, the earthy mushrooms a great food and wine pairing with rich, meaty red wines. 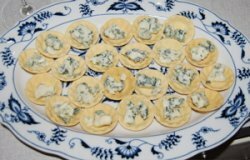 Blue Cheese and Truffle Honey Cups: We saw this served at a party a few years ago and fell in love with it. It is so easy and yet so delicious. As seen here, simply buy small cocktail pastry cups (available in many fine grocery stores and specialty gourmet shops, or you could make them) and fill them with a few crumbles of a salty blue cheese such as gorgonzola or Roquefort. Then lightly drizzle with white truffle honey. If you can't find truffle honey you can make it by combining honey with a small amount of aromatic white truffle oil. The salty and slightly sweet flavor combination, accented by the heady aroma of truffle is just great and goes well with many full bodied white wines and sweet white wines. Don't go too heavy on the honey or it can overpower wines with which you are tasting it. 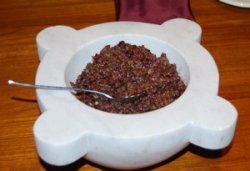 Tapenade: Tapenade is a puréed olive dish which usually consists of Greek-style black olives, savory, anchovies, garlic and olive oil in its simplest form. There are other variations of course as well. This is a really tasty treat that is great smeared over bread crusts or crackers. If serving as wine tasting appetizers, try to avoid making it too salty or spicy as the olive flavors are usually quite bold themselves and you don't want to get in the way of the wine you are tasting. These were just some ideas for wine tasting appetizers but you really can use any finger foods you like that pair well with wines and aren't too overpowering on their own. While we recommend keeping it simple to start, you can certainly make some very fancy wine tasting appetizers if you have the time and energy. If you have any great wine tasting appetizer ideas we (and our visitors!) would love to hear from you! Done learning about Wine Tasting Appetizers?